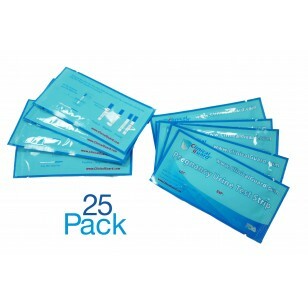 Easy to use, with an immediate display of the outcome makes hCG Urine Test Strips an ideal choice to determine pregnancy by detecting the presence of the hormone, human chorionic gonadotropin. Human chorionic gonadotropin, or hCG, is a hormone which is produced by the developing placenta shortly after conception and secreted into the urine. A hCG pregnancy test contains antibodies which specifically react with this hormone. To begin testing, open the sealed pouch by tearing along the notch. Remove the test from the pouch. Note: First morning urine usually contains the highest concentration of hCG and is therefore the best sample when performing the urine test. However, randomly collected urine specimens may be used. Holding the strip vertically, carefully dip it into the specimen (you may collect your urine in a clean, dry container). Immerse the strip into the urine sample with the arrow end pointing towards the urine. Do not immerse past the MAX Line (Marker Line). Take the strip out after 3 seconds and lay the strip flat on a clean, dry, non-absorbent surface. (Note: In rare instances when dye does not enter the result area, dip the tip of the test strip in the urine as instructed above until the dye begins traveling across the white result area). Wait for colored bands to appear. 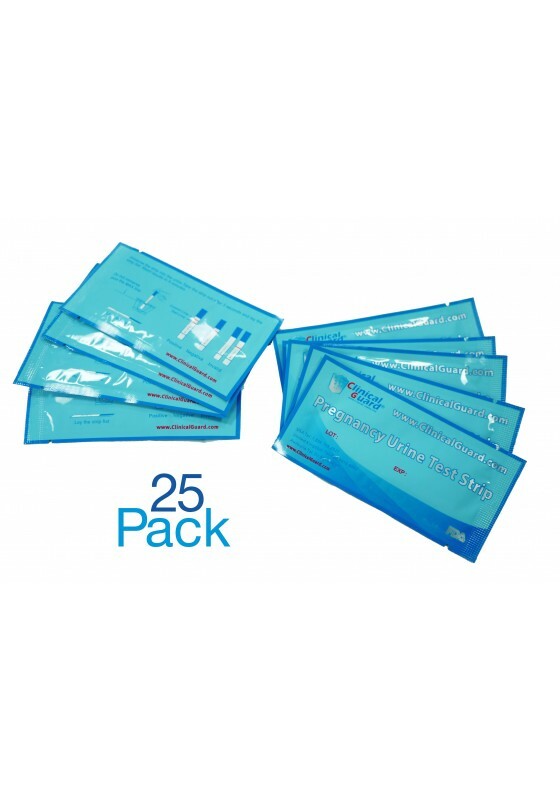 Depending on the concentration of hCG in the test specimen, positive results may be observed in as little as 40 seconds. However, to confirm negative results, the complete reaction time of 5 minutes is required. It is important that the background is clear before the result is read. Do not read results after the specified reaction time. 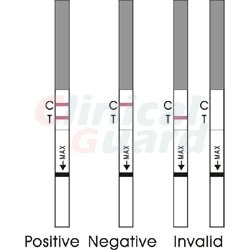 Not Pregnant or Negative Results: The Control Zone is marked with only ONE color band and there are no color bands in the Test Zone. This indicates that no pregnancy has been detected. Pregnant or Positive Results: The Control Zone and Test Zone are marked with distinct color bands. This indicates pregnancy has been detected. Since different stages of pregnancy have different concentrations of hCG hormone, the color intensity of the bands may vary. Please note: for the most accurate results, pregnancy test should be taken 10-12 days after ovulation. The earliest a pregnancy test can be taken to give positive results is seven days after ovulation. Not Pregnant or Negative Results: It is generally recommended that the test is repeated after few days should there be any reason to believe that the person tested is pregnant. Always consult a physician for further testing or for any uncertainties. Pregnant or Positive Results: Please note, under a small percentage of circumstances this test may read as a false positive.